C++ Programming 7 Edition C++ PROGRAMMING: FROM PROBLEM ANALYSIS TO PROGRAM DESIGN, Seventh Edition remains the definitive text for a first programming language course. D.S. 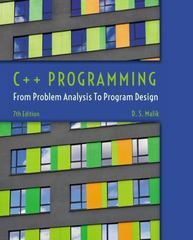 Malik's time-tested, student-centered methodology uses a strong focus on problem-solving and full-code examples to vividly demonstrate the how and why of applying programming concepts and utilizing C++ to work through a problem. This new edition includes updated end-of-chapter exercises, new debugging exercises, an earlier introduction to variables and a streamlined discussion of user-discussion of user-defined functions to best meet the needs of the modern CS1 course. An optional CourseMate brings C++ PROGRAMMING: FROM PROBLEM ANALYSIS TO PROGRAM DESIGN to life with interactive study tools including videos, quizzing, flashcards, and games. The CourseMate's digital Lab Manual offers additional hands-on exercises, allowing students to reinforce critical thinking through practice.